Now I don’t begrudge Mr. Capehart for eschewing the Kwanzaa holiday in lieu of the more mainstream holidays that puts his bosses, BFF’s and adversaries at ease. I have not celebrated it in a significant way since the late 90’s so it’s not at all one of those monolithic endeavors that would get your black card revoked if not adhered to. However as a black man working in the mainstream media it’s not a good look to be so overtly and needlessly dismissive of the cultural construct–it’s one of those opinions that he could and should have totally kept to himself. As a black man in mainstream media you should be duty bound to respect black culture–even aspects as obscure as the decades old Kwanzaa holiday. Especially when so many of its principals are so contemporaneously apropos. One could even argue that the 7 principals that comprise the holiday is the perfect panacea for the ongoing problem of police brutality and misconduct. It’s principals are the antithesis being a victim or a purveyor of violence. When Mike Brown was shot down in cold blood in broad daylight in August of 2014, in addition to claiming the life of an 18 year old college bound African-American, those bullets that recklessly exited Officer Darren Wilson’s gun sent out a clarion call to African-America. It was in and of itself a unifying call. Umoja which is the first principal of Kwanzaa is all about unity and even though it was precipitated by a heinous act of hate, the spontaneous combustion that ensued gave rise to a movement. One that is focused, fortified and fearless. An American spring led by a black agenda with tangible demands. #blacklives matter is one of the central themes of the movement–now what’s more Kwanzaa than that? A lack in the self-determination has been a problem possessed by the black family ever since the first slave ships reached the shores of Jamestown VA, in 1619. Some 395 years later it still remains the crux of the problem as it pertains to full equality for the black family in America. Self-Determination, or Kujichagulia as it pertains to the current grass rooted protest is what has people like Pat Lynch and other notable and formerly respected voices speaking in such unhinged ways exposing to the world what community activists have long decried as an endemic and systemic culture of abuse and disregard for black life within the department. 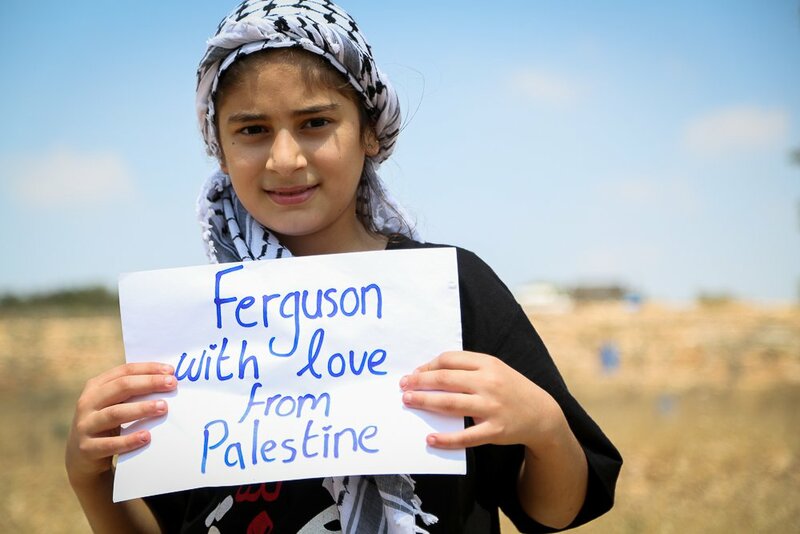 Self-determination is not just putting your enemy on blast. It’s also respectfully telling your friends “no can do” just as these very same protesters that are being threatened with war did Mayor De Blasio upon his request that protest be halted until the two slain officers are buried. 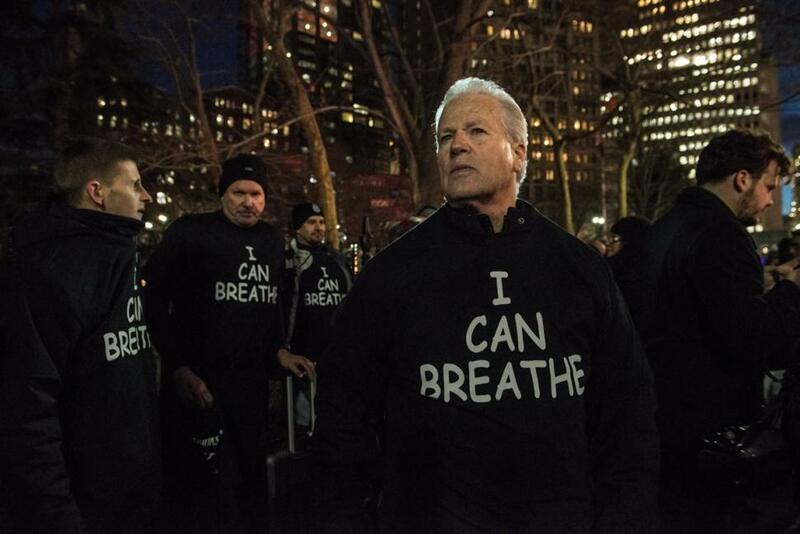 If the “benevolent” officers of NYC see fit to wear “I Can Breath” t-shirts as an affront to the protest and as a show of support for killer cops, than protesters should be able to continue the protests that have absolutely nothing to do with two slain officers. 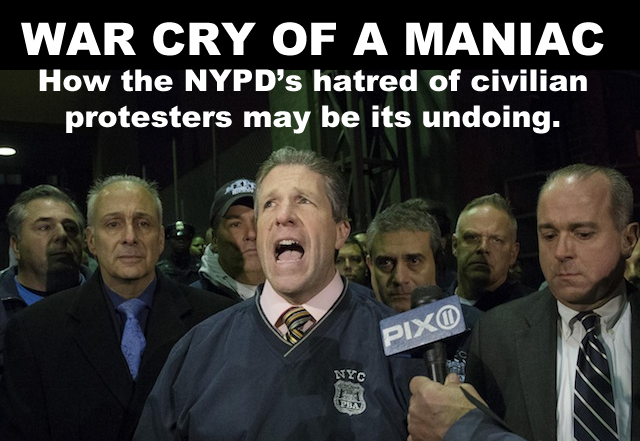 One could never accuse NYPD of being too sensitive (or bright). 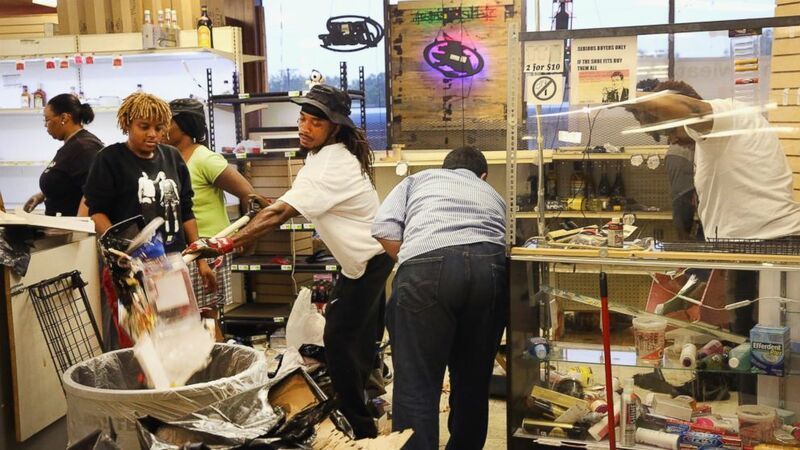 The News Media is quick to show who rioted, looted and burned the place down, but they’re awfully slow to show you who was out there cleaning it up. If they show it at all. Being that many of these protests, from Ferguson to NYC are carbon copies of protests from the past, the mere notion of people today petitioning their local, state and federal government for redress of long standing grievances indicates ones connection and more over ones understanding that we who protest in 2014 stand firmly on the shoulders of those that were fighting this same power in 1964. Ujima reminds us that we are part of a continuum. One that we too must pay forward with our blood, sweat, tears and even lives (for some). The 4th Kwanzaa principal is perhaps the crown jewel when it comes to principled protest. The power of the purse just as it did during the Montgomery Bus boycott has the power to move the previously immovable. 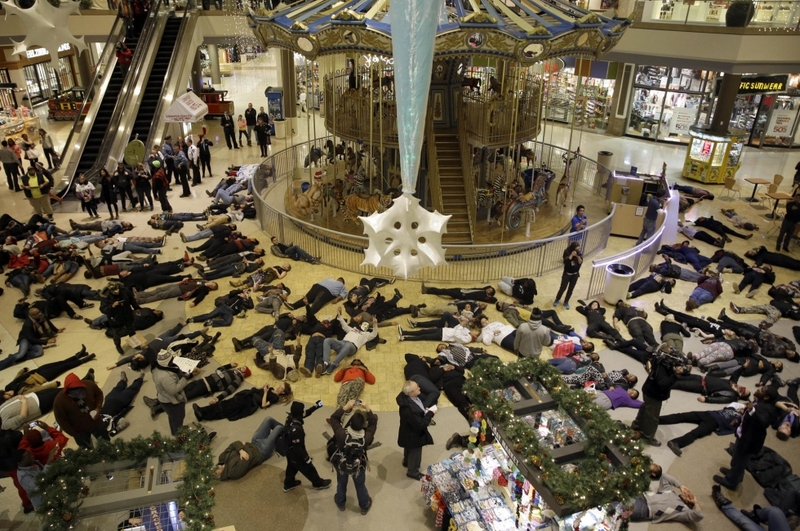 When the call went out to boycott Black Friday a lot of black people balked. They rightfully logically surmised that a single day of abstaining from shopping will only net higher sales receipts the following days as Black Friday merely marked the beginning of the holiday shopping season. With that point duly noted many decided to sit out the entire 2014 Christmas shopping season. Black Friday sales were down about 11 percent and while I don’t know the exact figure overall, I do know that it’s down from last season. It’s not down in a mountain moving kind of way but this is just the beginning. Next year with a little more honing the holiday season boycott could be every bit as effective a weapon as the Montgomery Bus boycott which itself took well over 300 straight days of all manners of sacrifice to come to fruition as the game changer that it was. A sustained annual protest of Black Friday and the commercial Christmas holiday shopping season, if done in a unified manner could be the the most powerful weapon wielded collectively since Rosa Parks refused to give up her seat to a white man. And here’s why: Many of the giant retailers like Target and Walmart that siphon the expendable incomes of poor to upper middle class blacks are strategically located in or around these majority black communities. This means that black people, and black people primarily have the ability to stop many of these stores bottom lines from ever getting out of the red and into the black. That’s a pretty powerful thing to do. It’s one hell of a statement to make. Especially since both Walmart and Target are already in the legislative game. Often times to the peril of many of their shoppers so there really is a direct correlation and leaning on them as a political strategy is actually the logical thing to do. The American Legislative Council (ALEC) is an organization of corporate conglomerates that lobbies congress and state houses across the nation for laws and bills most favorable to their respective bottom lines. One of the more nefarious bills successfully lobbied for and implemented around the country is the Stand Your Ground law. You don’t need me to remind you of how bad such a law is for black people. However you might want to remind Walmart that #blacklivesmatter. The money saved from being spent with these major corporate conglomerates could and should be spent with black and small neighborhood businesses so that the dollars you spend actually have a chance to contribute to the growth of your community. Protests must have principal and in order to find principal in protest one must establish purpose. 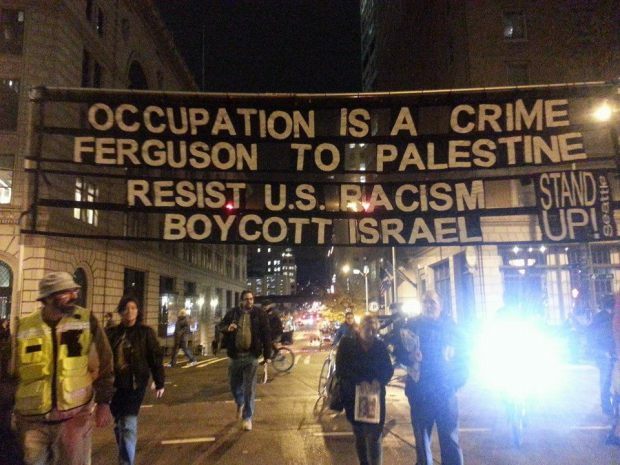 Truth be told their has been a purpose for organized protest for many centuries now. Along the way we have been side tracked and distracted but thanks to people like George Zimmerman, Darren Wilson and Daniel Pantaleo we will never forget our purpose. It’s very easy to get caught up in the current pathology that engulfs black people today and come away discouraged. Devoid of a long view that employs nuance of thought it’s completely logical to come away with a rather pessimistic view for the future. It’s even easier to come away with the opinion that these protests are a waste of time and energy and will yield zero gains. Such primordial misunderstanding is understandable but no longer acceptable. No longer can we rely on short views of historical problems. No more vacuous conversations that at best can only come up with linear solutions to holistic problems. Imani does mean faith, but it ain’t the kind of faith that you learned about in Sunday school. It’s not blind faith. It’s an open up your damn eyes and look what’s going on (and has been going on) kind of faith. Once that kind of perspective is gained it is rarely lost. It is more often than not spread. In summation the sum total of the 7 day celebration is one that runs parallel to the mission at hand, so why not partake? It’s not a religious holiday, nor does it conflict with the Christmas holiday. And since Santa Clause has next to nothing to do with Baby Jesus in the manger it even makes sense to do your gift giving AFTER the 25th. It also makes very sound personal economic sense since pretty much everything that you purchase will be discounted to the tune of 70 percent o better. I haven’t celebrated Kwanzaa, conventionally since the 1990’s either. But I couldn’t agree more that this is the season to live the Principles of Kwanzaa daily. These principles give our current ‘awakening’, focus and momentum. I definitely did not shop this holiday season. This is a first for me. But I plan to practice Ujamaa (Cooperative Economics) all year. We must use our economic power! Kudos for a great article! I like how you thread the meanings and define its use and usefulness at this point and time. Previous Previous post: What is “Black on Black” Crime? And Why do we always hear about it when White cops kill innocent unarmed blacks?